I saw promos for Grease Live! before it aired on Fox TV earlier this year that made it look (at least, to me) like a small budget production (as it turned out, it wasn’t, not by a long shot). I wasn’t sure I wanted to watch, since I’m not a big fan of the 1978 movie Grease starring John Travolta and Olivia Newton-John. I’ve seen other live musical productions recently on television and wasn’t too impressed — Peter Pan Live! in particular was pretty awful. That’s why I was surprised when I not only liked Grease Live!, I loved it. Likely everyone knows the story, but here’s a brief recap. Sandy and Danny meet at the beach during summer vacation. He works as a lifeguard and tells her he attends private school. She’s on vacation from Salt Lake City. When Sandy surprisingly shows up at Rydell High and befriends a group of girls called the Pink Ladies, they soon realize that her Danny is none other than their Danny, the leader of the T-Birds – a group of greasers who are harmless, but they’re definitely not private school boys. Rizzo, the leader of the Pink Ladies, immediately decides she’s going to have fun when Sandy finds out Danny’s not a prep school kid — so she decides to save the news for exactly the right moment. It appears Rizzo had a thing for Danny, but the feelings weren’t reciprocated, so she takes great delight later when she introduces the two. Julianne Hough, known for her roles in the musical movies Footloose and Rock of Ages, and the romantic drama Safe Haven, was a perfect choice as Sandy. In addition to possessing acting skills, she’s an unbelievably talented dancer and singer. When she tries out for a position on the cheerleading squad, her dancing skills are obviously far better than most lead musical performers — her moves are precise and perfect, which is not too surprising, since she started out as a dancer. Vanessa Hudgens, who plays Rizzo, is best known for playing good girl Gabriella in the High School Musical movies, although she’s also starred on Broadway. It was a treat to see her play a bad girl — a complete contrast from previous roles. But most surprising for me was Aaron Tveit. I didn’t recognize him from his role in the movie version of Les Misérables — I didn’t know who he was when I watched it on the big screen, but I remember thinking he was a standout as Enjolras. I also wondered about the choice of a blond Danny, but I was soon won over. Aaron is an amazingly talented singer who has starred in numerous roles on Broadway. His dance moves are great as well, but it was his acting that impressed me. He was a totally different Danny than John Travolta. I found Travolta’s acting corny and over the top. Aaron played Danny like a real person, not a character in a stage musical. He conveyed a deep level of hurt when Sandy was angry with him; his swagger when he was with the other guys was fun to watch and he played Danny with a sense of decency that was evident in several scenes and made him stand out from the other T-Birds. The production, mounted by two directors, was quite an undertaking. It took place over several sound stages and the actors were driven back and forth, changing outfits on the run. In one number, sung by the multi-talented Keke Palmer as Marty, she wears no less than four layers (including a duplicate outfit) and tears each one away as the scene changes (in one change, they go to a closeup of her face, and when the camera draws back, she’s wearing something different), but it’s difficult to see how it was done if you don’t see the behind-the-scenes explanation. And when you know how it was done, you realize how much work went into that one number in regards to costumes for one character alone. At the end of the show, you see all the performers get into massive carts (driven by the lead actors) and head to various locations on the set to perform the final number. It’s mind-boggling how they pulled this off with less than two months to rehearse. Other things I loved about this production was the inclusion of Didi Conn, who played Frenchy in the original movie, as the owner of the diner where the T-Birds and Pink Ladies hang out, and Eve Plumb, who played the shop teacher with a prison background. You might remember her from her role as Jan on The Brady Bunch. 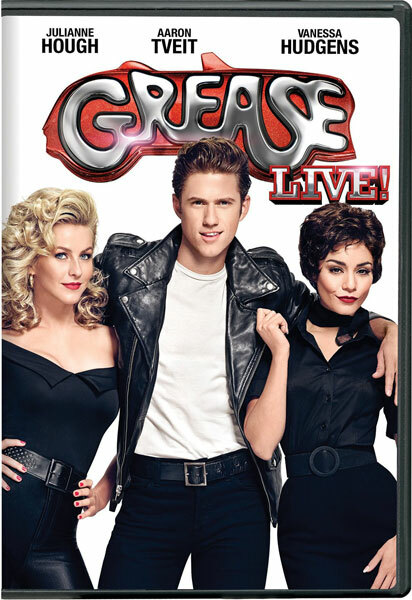 The DVD special features include: Without a Net: Performing GREASE LIVE! ; Becoming the T-Birds and Pink Ladies; Greasin’ Up the Joint; Be-Bop, Swing and Jitterbug: The Choreography of GREASE LIVE!, in which we’re shown how to do the Hand Jive; When Was Your First…? in which the cast members have some fun with a game that results in the actors revealing their first experiences; and My Favorite Grease Moment, in which the actors talk about their favorite moments from the movie version. If Taylor Hicks is in this I’m adding it to the collection.